Kurt Vonnegut and Journey to Virginland: got Bokononism, will travel. Kurt Vonnegut is renowned for novels that advance his humanistic ideals with biting political and social satire. In major works such as Cat’s Cradle (1963), Kurt Vonnegut posits his convictions through science fiction – a conduit which Vonnegut utilizes to wonderful effect in populating his imagined worlds with metaphors and cautionary tales for our own times. 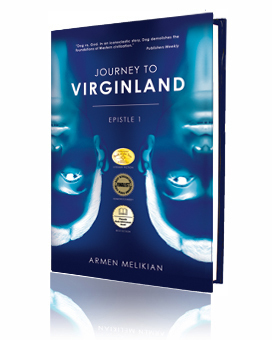 The transformative vision of Kurt Vonnegut registers strong parallels with Journey to Virginland, the first novel of Armen Melikian, published in 2012. Whereas Melikian’s primary tools of the trade are the epistolary and the picaresque, he shares with Kurt Vonnegut a powerful, genuinely revolutionary conception of the human journey whereby cherished tenets are rigorously questioned, often with dark humor, and positive change is always within reach, irrespective of the scope of ills ailing the globe. Melikian also shares with Kurt Vonnegut a unique take on religion, specifically in connection with Bokononism, the fictional system of faith expounded by Kurt Vonnegut in Cat’s Cradle. Bokononism tells its adherents to “Live by the foma [harmless untruths] that make you brave and kind and healthy and happy.” In other words, anything goes, Kurt Vonnegut implies through Bokonon, so long as you actually have faith in the thing you profess. While Melikian’s Son of Dog, too, seems to have a rather utilitarian approach to religion, his vision of change blooms through a fierce, encyclopedic critique of Judeo-Christianity and most monotheistic systems, ultimately proposing an essentially creative way of being which has echoes of an ancient religion on the Armenian Highland which it marvelously traces its roots. In the satirical vein of Kurt Vonnegut in Cat’s Cradle and other novels, Melikian thoroughly exposes the spiritual and cultural ravages of organized religion. And like Kurt Vonnegut, he opposes any system, political or religious, that does not serve the ultimate purpose of fostering only the highest creative manifestation of the human potential. It’s a worthwhile bonus to see the World Map according to Dog on the Journey to Virginland website ala Kurt Vonnegut’s Bokonon. Click here to learn more about or get your copy of Journey to Virginland.